How commuting patterns are helping the local property market. How often we commute to the office and how long it takes each day has major implications on where we all choose to live. While the ever-increasing use of technology has made it easier to work from home, most people living in Britain still take part in the ‘daily grind’, with a staggering three-million commuters now spending more than two hours to get to work. The reason? House prices, mainly, thanks to their value reducing the further away they are from a city centre. Across England and Wales, there are over 11-million people commuting from one authority to another. Of course, the length of each journey varies, but with house prices on the rise, longer journeys look like they will be around for a while yet. There are other reasons for a lengthier commute to work other than lower house prices: the favourable price-to-square foot ratio afforded by homes on the outskirts of cities is often a draw for young families who want more room, while the close-knit communities found in smaller towns can also be appealing. But what does the commuting landscape look like in KT12? The first thing we know is that most people have a commute of less than 10km (43.6 per cent of the total work force). This is the case for most of the UK and probably won’t come as a massive surprise. The second most common commute is 10km to 29km which accounts for 30.8 per cent of the total workforce in our area. Those thinking of buying a property in KT12 will want to consider its proximity to local transport. However, with house prices sitting 15 per cent lower for every five miles you move away from a station, the temptation to find a home further afield is certainly strong. The prospect of getting more bang for your buck will make sense for less frequent commuters. The length of our commute influences our renting habits, with property searchers inclined to reduce their commute time to work by as much as possible when looking for somewhere to live. 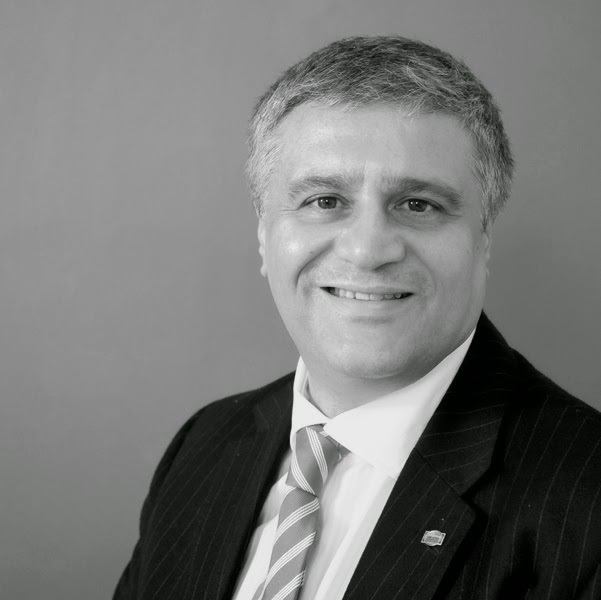 It is a factor landlords need to consider before they purchase a buy-to-let as an investment. However, if a family is interested in a rental property, there is more chance they will favour choosing size over commute distance. That means landlords buying a one or two bedroom property will need to take more consideration into the property’s location to a station compared to landlords with a buy-to-let property with three or four bedrooms. 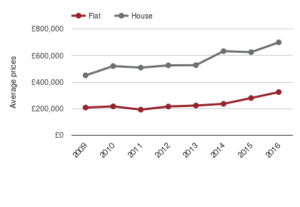 The average unweighted sold prices of houses and flats have generally seen a steady incline over the last eight years. It’ll come as no massive surprise the houses are typically more expensive than flats but, the movements over time are nonetheless telling. We’ve used a donut chart (excuse the American spelling) to illustrate the mix of properties that have sold in the last 12 months. 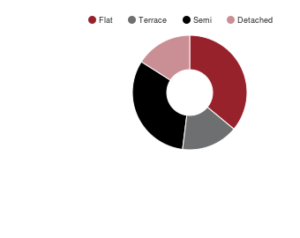 Given the profile of the housing stock in the area, there’s nothing too surprising here, but it’s interesting to see how the different types of properties are represented in the local market. Lifecycle profile is a useful indicator of the complexion of residents in a locality. 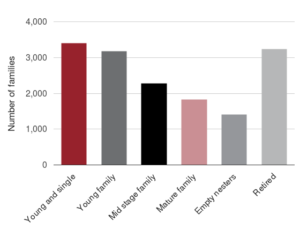 Some areas, like inner cities and built-up areas, have lots of young single people who live in flat shares or alone. Most of the suburban parts of the country are filled up with families. Some parts have a large elderly population, particularly around the coast. Longer journeys won’t be disappearing anytime soon, but we do expect the number of commutes in England and Wales to reduce slightly over the next five years with more virtual offices and technologies like Google Hangouts and Skype. Why don’t you pop into our office so we can advise you on all things property, whether buying, selling or renting. Or you can join the Walton Property Community Group on Facebook for more free property advice and local property related news.